Workplace drama seems inescapable. Hamsters suffer from it, as people get frustrated with each other after spending too much time together. Academics suffer from it, as people spend too much time apart and forget how to look at situations from another point of view. Either way, drama is the one thing that will destroy your work life and unravel all your projects. Why is drama so dangerous? Drama is contagious. Once someone starts in with the drama, it will spread. If a person is allowed to be dramatical, then others who have kept their inner drama queens quiet might let them loose. Drama obscures the purpose of the original meeting or project. A dramatical person will make the meeting all about his or her personality. They may suggest that if a project is carried out in a certain way, they will never recover. That may or may not be true. You won’t be able to tell with all the theatrics in the room. 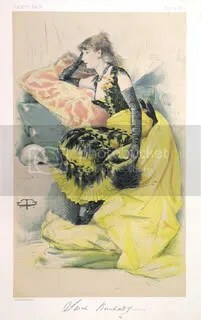 Caricature of Sarah Bernhardt from 1879 Vanity Fair. From Wikimedia Commons, public domain. Factions form. A dramatical situation is polarizing. People will flock to support the individual with the complaint, or they will band together against the individual. Even if all parties involved disagree on one subject, such as which color of Post-Its to order next month, people won’t be able to work together on the whole project. Gawkers get involved. When something happens in your neighborhood, you’re bound to see a cop on the sidelines, informing gawkers, “There’s nothing to see here! Please go about your business! There’s nothing to see here!” Well, that’s only going to encourage other gawkers. While employees are gawking at the strife, they aren’t getting their work done. Workplace drama is distracting and a huge time-waster. Most problems can be resolved without it. In the next few days, you’ll read about what to do during a drama outbreak and how to handle the aftermath.